You see, last fall I had this bright idea to use some of the fleece skirtings as mulch in my flower beds. It might have worked all right if we didn’t have chickens free ranging. Unfortunately, I didn’t think about how the chickens would be constantly scratching out the wool as they forage for bugs. Every time The Farmer tries to mow the grass, he has to rake the wool back into the flower beds. It wasn’t one of my better ideas. 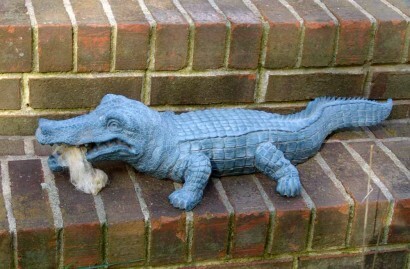 Anyway, at some point, some of that wool ended up in the alligator’s mouth and I took a picture. The picture prize is now printed and ready for boxing and mailing to Jenny. Amy from “Amy’s Corner” won the prize and asked for me to choose a picture of chickens. 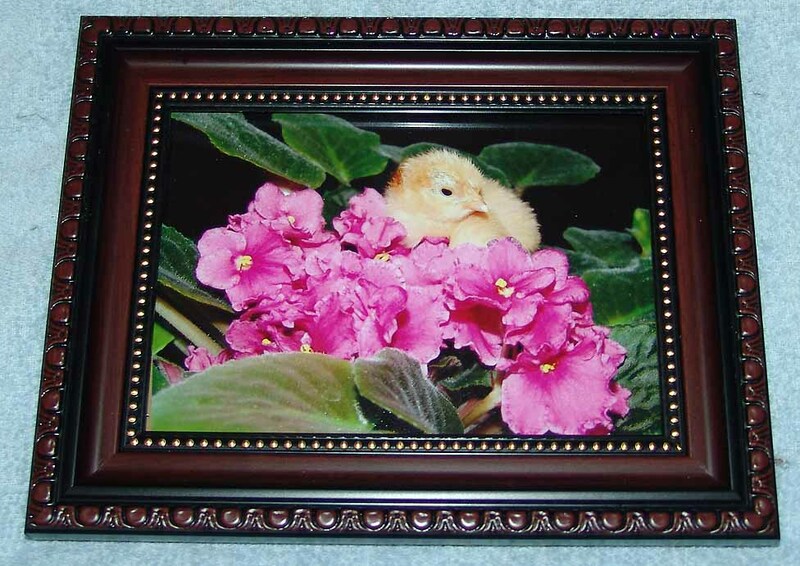 This Buff Orpinton chick on violets is one of my favorites, and I hope she likes it too! I really liked the frame, but unfortunately, when I went back to get another, they had sold out and I had to settle for a much plainer frame (sorry Jenny). I have ideas bubbling in my brain (scary) for more contests and prizes, so stay tuned! Okay, The Farmer informs me the contest in the previous post from Friday is too hard. Forget the eggs part. 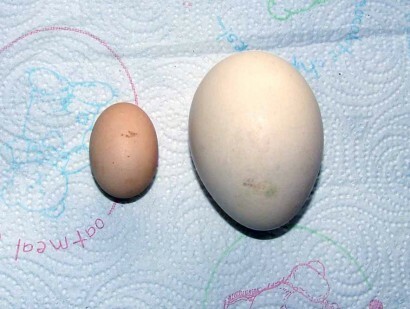 I’ll tell you right now, the bigger egg is a peafowl egg, and as I already mentioned, the small egg is just an itty bitty chicken egg. I thought it was super easy, but The Farmer says that’s because I’ve seen it so much. However, I know there are lots of other people reading this who have also seen the same thing many times. At any rate, if nobody guesses by Friday, I’ll tell you the answer then! Mind you, I’m not talking about alligator eggs! Two different things here. The first part, the eggs, are my picture of a little bitty egg we got a while back, beside another egg for comparison. This little egg syndrome seems to be going around, and several chicken keepers (herders? wardens?) 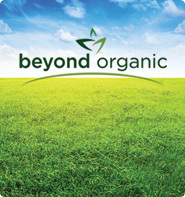 have posted about it, like on “My Little Bit Of Heaven” and at “On The Way To The Critter Farm“. I guess it’s just a glitch in the start-up of egg production. Can you guess what kind of eggs they are? As for the alligator part of the post, there’s a little one in our front yard. It would seem he helped himself to a snack. (Or perhaps The Phantom Son assisted him.) As you can see, he’s still got some sort of leftovers in his jaws. Be the first to tell me exactly what it is, and what kind of eggs are in the picture above, and I’ll send you a 5×7 picture of the gator, or any other picture you choose from Rural Ramblings. Eggs and alligators – life’s always interesting around here! Congratulations Amy, you were the first one to guess correctly! I noticed him (her?) 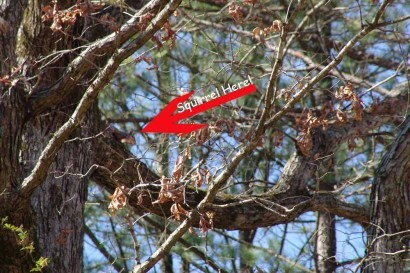 when I went out to our mailbox one morning, sitting on a big limb in the oak tree at the end of our driveway. It was calling and calling and calling. And here I used to think I was hearing birds when I heard that sound! 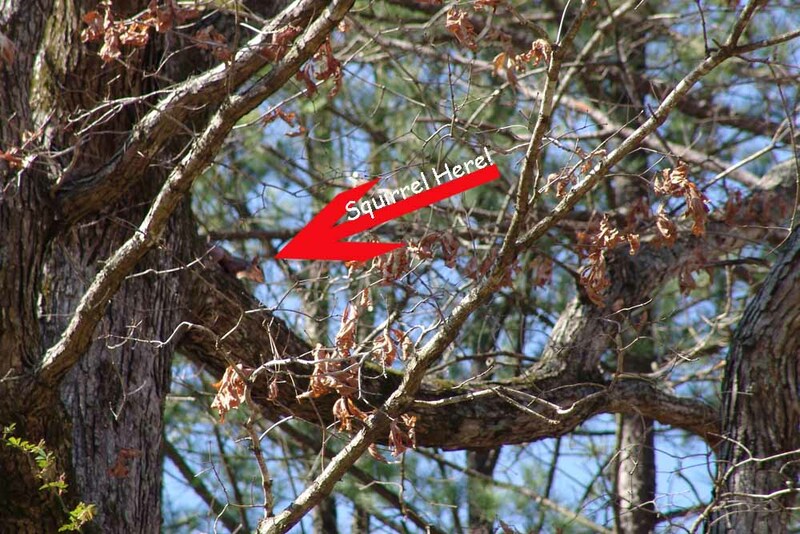 I tried several times to get a good picture of this squirrel, but he was far up in the tree in deep shadow with bright light behind. The picture above was the best I could do! My thanks to those who participated in this little contest. Stay tuned, because I plan to have more sometime!